Caught these strange street performers doing their thing at the Merchant City Festival. They were dead funny, and just a little creepy too! Come on - sure you must all have some great pics from last year? Get them up for us all to see! Comments for Alice in La-la-Land! ...they give me the heebi-geebies! don't think I was in Brunswick Street last year. great buzz generally though. I'm goin again this year for sure. I was at the festival but missed them. Does anyone know if they're coming back this year? I saw them as well - nice shot! ..and - yeah - they freaked me out too! 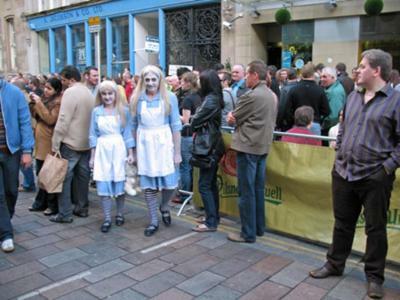 I love this pic and I especially love the great cafe-bar-restaurant these creepy Alices are lurking beside. Did you visit last year? Brutti Ma Buoni in Brunswick Street is one of my absolute faves in Glasgow's Merchant City. And tucked inside the funky Brunswick Hotel too. A cool place to hang, especially during a festival. Looking forward to this year's Merchant City Festival too. It looks even bigger than before - a few old favourites and tons of new stuff. Join in and write your own page! It's easy to do. How? Simply click here to return to merchant-city-festival.